(LONDON) The Canadian Men’s Wheelchair Basketball Team opened their London 2012 Paralympic Games with a 68-53 win over Japan. Patrick Anderson, of Fergus, Ontario, led the charge, scoring all of Canada’s 16 points in the first quarter as part of an impressive 29-point half, in which he scored the first 23 points for Canada. “It’s not something I’ve done before at this level, but I always try to have a strong start to build confidence for the team,” said Anderson. Anderson finished with a game-high 32 points and 13 rebounds, going 15-for-21 (71%) from the field, nearly matching his career-best single game total of 35 points (in a semi-final win over the Netherlands at the 2004 Paralympics). “In terms of effort and focus, I think we met our goals,” said Anderson. 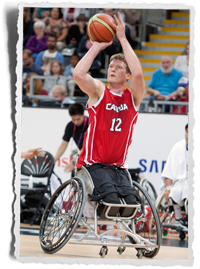 Anderson’s also set a Canadian men’s Paralympic record for most two-pointers in a game with 15, besting his previous marker of 14 (set against Great Britain in 2000). “It was like in the movie ‘The Avengers’, when they see the bad guys coming, one of them says, ‘They have an army’, and the other says, ‘But we have a hawk’. We have Patrick Anderson and he’s one of the best players in the world. We had a good game plan. We’d played them (Japan) before, so we know their threats and how to counter them. We played a really good defensive game, with real team defence, and we had a height advantage that we were able to use,” said Team Canada co-captain David Eng. Bo Hedges, of Wonowon, British Columbia, chipped in 12 points, while Yvon Rouillard, of Montreal, Quebec, scored six for Canada. Japan mounted an unsuccessful comeback late in the game, outscoring Canada 22-15 in the final quarter. The Japanese were led by Reo Fujimoto, who alongside Anderson, also had a double-double, finishing with 16 points and 11 rebounds. Next up, Canada will face hometown Great Britain Friday August 31st at 9:15pm BST. The two teams recently played each other in a four-game series, with Canada winning three times.